The Contemporary Arts Museum Houston (CAMH) is pleased to announce the upcoming exhibition Nicolas Moufarrege: Recognize My Sign. During a career that lasted just over a decade, Nicolas Moufarrege (1947-1985) created an original and idiosyncratic body of embroidered paintings. 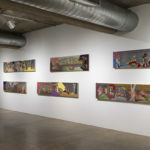 Nicolas Moufarrege: Recognize My Sign—the artist’s first solo museum exhibition—traces the development of his work from the lap-scaled portrait-tapestries he produced in Beirut, Lebanon in the early-1970s to the final works he created in New York City, New York in 1985. This exhibition is organized by CAMH Curator Dean Daderko. The Museum will host a public opening reception on the evening of Friday, November 9, 2018 from 6:30–9 PM. The exhibition will be on view through February 17, 2019. As always, admission to CAMH is free. 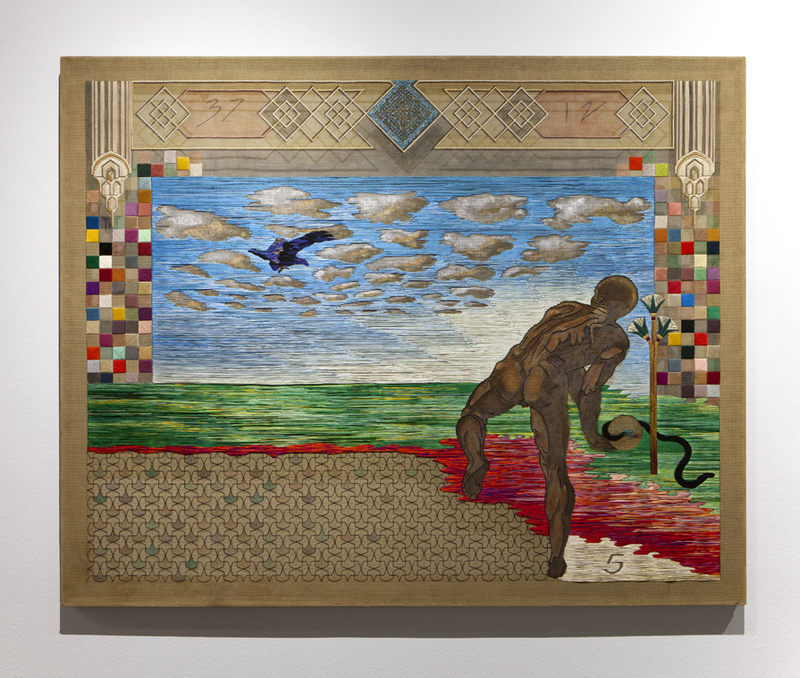 A dedicated appropriator, Moufarrege culled images from a broad and vast sourcebook; his embroidered paintings mix references from Classical sculptures and Baroque paintings with comic book heroes, Islamic tilework designs, Pop Art, and Arabic calligraphy. 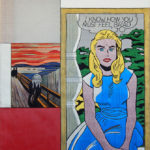 He borrowed images from paintings and prints by artists such as Katsushika Hokusai, Edvard Munch, Pablo Picasso, and especially Roy Lichtenstein. If appropriation provided the artist with raw subject matter, it is his pointed juxtapositions of images that most clearly reveal Moufarrege’s wit and thoughtful intelligence: his stitched paintings tell stories. The earliest artworks included in this exhibition are Moufarrege’s embroidered tapestries. In a 1973 review of his first exhibition at Triad Condas Gallery in Beirut, the artist Etel Adnan remarked that Moufarrege’s work followed “mysterious laws that support the seemingly free combination of forms.” Indeed, these early works are notably improvisational: the artist began stitching on needlepoint canvas without preliminary sketches, and the resulting figures and scenes appear to grow and change in the most organic of ways. An eye becomes a flower; red hair looks like the flames burning in a campfire. 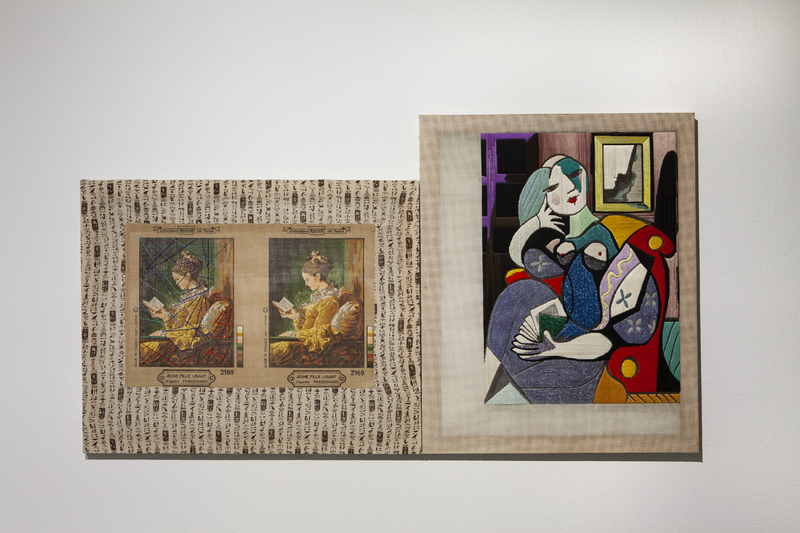 Works Moufarrege made in Paris, France in the late-1970s incorporate embroidery alongside painted passages on the stretched needlepoint canvas. This approach allowed Moufarrege to create compositions on a more ambitious scale, and to put his work in dialogue with painting in a more direct way. 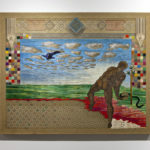 The subject matter of these paintings is primarily figurative: male bodies, seen from behind, are found gazing into fantastical landscapes full of sunsets and volcanoes that merge into geometric patterns drawn from Islamic tilework and Japanese textiles. The artist’s move to New York City in 1981 initiated yet another sea change in his approach to imagery and composition, coinciding, as it did, with the advent of postmodern tactics of appropriation. Where his earlier works referenced figures borrowed from Baroque prints and paintings by Guido Reni or Peter Paul Rubens, Moufarrege’s New York paintings juxtapose images with a more sharply critical and humorous eye. 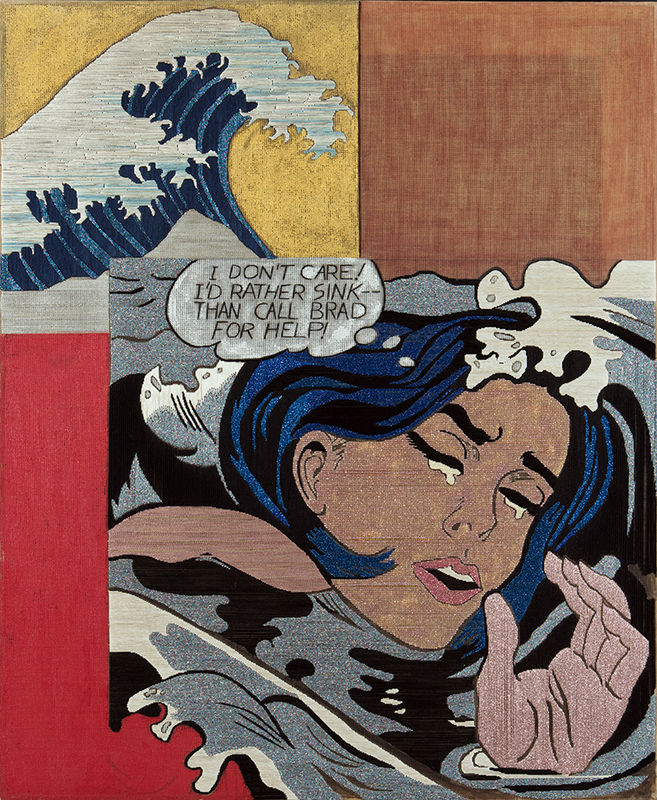 In one iconic work, Title unknown, (1984), a stylized wave adopted from a woodblock print by Hokusai is positioned in the upper left corner of a painted embroidery canvas, and Moufarrege copies an image of a Lichtenstein painting into the bottom right corner of the same canvas. The portrait of a heroine sinking into deep waters includes a thought bubble announcing, “I don’t care! 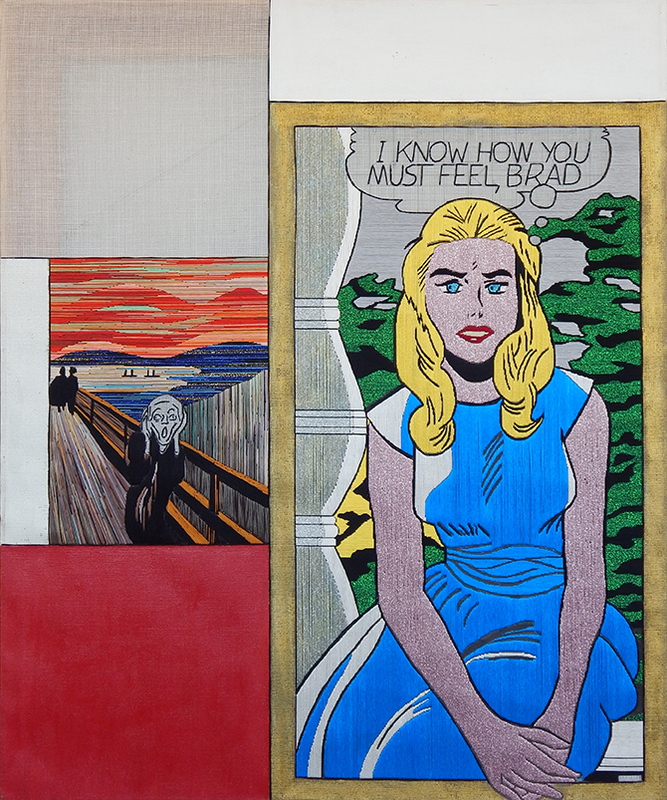 I’d rather sink–than call Brad for help!” In Moufarrege’s juxtaposition of the two images, the wave appears perpetually ready to swamp the already drowning woman. The Truth About John the Baptist (1983) is a pastiche of embroidered images: the comic book characters Silver Surfer and The Thing bookend a depiction of Moses in the bulrushes; floating atop the scene, the statement “My father taught me Arabic calligraphy” is rendered in calligraphic flourishes. Eschewing binaries like East and West, fictional and real, and by establishing temporal connections between history and the present, Moufarrege posits new ways to connect with and approach narrative storytelling. He does so as a knowing provocateur, with a wink and a smile, offering us new ways to address images, situations, and layered identity. 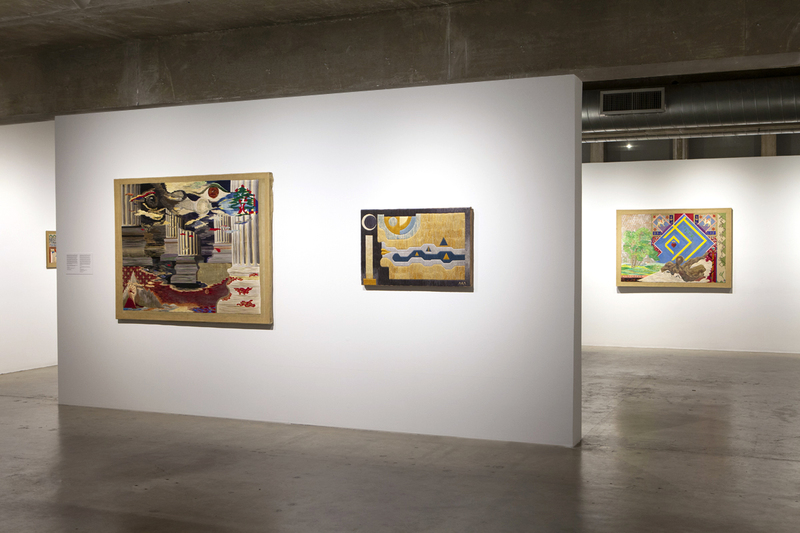 Including nearly 40 tapestries and canvases, as well as drawings, photographs, and primary documents, Nicolas Moufarrege: Recognize My Sign follows the artist’s relocations from Beirut to Paris to New York, and considers the effects these moves had on the development of his oeuvre. Transitions from tapestries to paintings are paralleled by growth in scale and ambition, and we see the testing of intimate narratives. These stories, developed and confident, speak volumes about the artist’s experiences, his thoughts, humor, and fantasies. Nicolas Moufarrege’s artwork draws from personal experience—including references to his travels and migrations, and his identity as a gay man—but it exceeds these individual boundaries. In doing so, it offers a myriad of ways to approach contemporary painting, figuration, craft, transnational identity, desire, and queer life. Nicolas Moufarrege: Recognize My Sign is accompanied by a full-color, fully-illustrated catalogue. With contributions by Curator Dean Daderko and writer and critic Kaelen Wilson-Goldie, this publication—designed by NUU— also includes biographic and bibliographic information on the artist and a checklist of works in the exhibition. Nicolas Moufarrege: Recognize My Sign will travel to Queens Museum, New York from October 5, 2019–February 16, 2020, where its presentation will be coordinated by Curator Larissa Harris. Nicolas Abdallah Moufarrege (1947–1985) was an artist, critic, and curator born in Alexandria, Egypt to Lebanese parents. He received undergraduate and graduate degrees in chemistry from the American University of Beirut, Lebanon in 1965 and 1968, respectively. 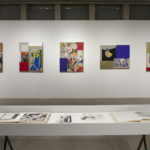 In 1968 he moved to Cambridge, Massachusetts on a Fulbright Grant and a Harvard University assistantship; it is during this time that he decided to pursue a career in the arts. 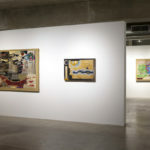 He returned to Beirut and had his first solo exhibition of tapestries at Triad Condas Gallery in 1973. With the onset of the Lebanese Civil War in 1975, Moufarrege relocated from Beirut to Paris, France. During this period, his work was included in exhibitions at Mathaf Gallery, London, England (1976); Gallery Kamp, Amsterdam, Netherlands (1977); George Zeeny Gallery, Beirut (1979); and Galeries de Varenne/Jacques Damase, Paris (1980). In 1981, Moufarrege moved to New York City, where he became a central figure in the burgeoning East Village arts scene. His writing for the New York Native, Arts Magazine, Flash Arts, and Artforum is credited with bringing early attention to galleries including FUN Gallery, Gracie Mansion, Civilian Warfare, and Nature Morte, and to artists and friends including Greer Lankton, Jean-Michel Basquiat, Fab 5 Freddy, and David Wojnarowicz. 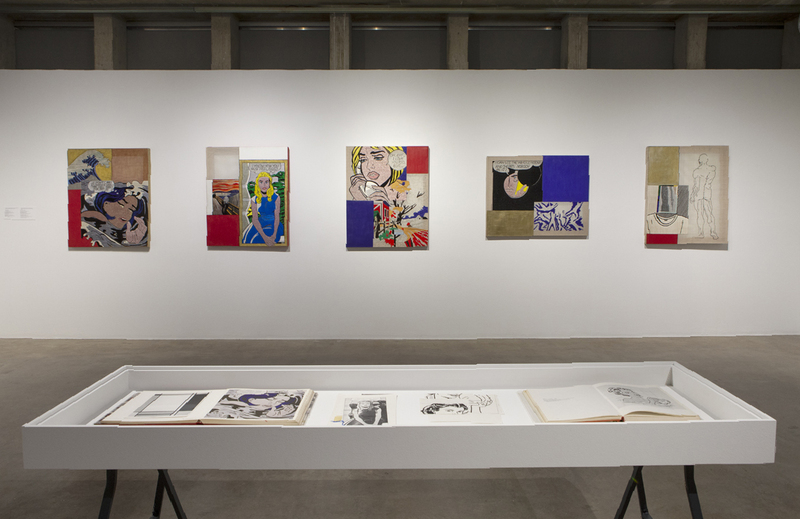 From 1982-84, Moufarrege received a studio through the International Studio Program at PS1, the Institute for Art and Urban Resources (now MoMA PS1); he had two studio exhibitions, The New York Times Front Page in 1982 and A Flag for the ‘80s in 1983. Moufarrege had two solo exhibitions in New York: On Pins and Needles at Gabrielle Bryers Gallery in 1983 and a FUN Gallery in 1985. 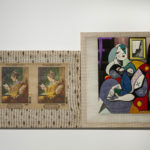 Moufarrege also curated exhibitions; he organized Intoxication at Monique Knowlton Gallery in 1983 and Ecstasy in 1984. In 1985, Moufarrege passed away at age 37 from AIDS-related complications. He is survived by his sister Gulnar “Nouna” Mufarrij, his brother Nabil Moufarrej, and his family in Shreveport, Louisiana. In 1987, Tim Greathouse, Cynthia Kuebel, Elaine Reichek, and Bill Stelling organized a memorial exhibition of Moufarrege’s work at the Clocktower, the Institute for Art and Urban Resources, founded by Alanna Heiss. 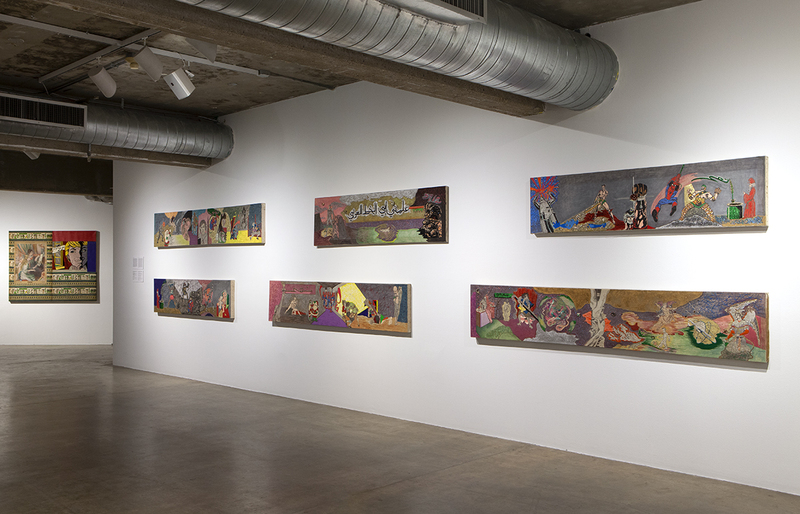 Since then, Moufarrege’s work has been included in The Downtown Show (2006), curated by Carlo McCormick in consultation with Lynn Gumpert and Marvin J. Taylor at New York University’s Grey Art Gallery, and SIDE X SIDE (2008), curated by Dean Daderko for Visual AIDS at La MaMa La Galleria. Listen to an audio tour of Nicolas Moufarrege: Recognize My Sign presented by Musiqa Houston. Learn more about the artist and exhibition through brief audio introductions followed by musical pieces that were presented in a loft concert at CAMH. Check the calendar to find out more about Musiqa’s upcoming programs at CAMH. Nicolas Moufarrege is organized by CAMH Curator Dean Daderko. Exhibition labels are available in English and Spanish.